This is the second part of my review of New Documents Volume 10. Here is the first part, which includes an overview of the book up to the first two sections. J. R. Harrison has four articles under the heading “Cult and Oracle,” including a papyri describing how Artemis overcame an evil sorcerer. The inscription is from a white marble slab from Ephesus, dated to A.D. 165. The article interacts with Clint Arnold’s Magic in Ephesus, which tends to describe Artemis as a demonic goddess, and R. Strelan’s Paul, Artemis, and the Jews of Ephesus, which argues Artemis is associated with salvation from evil spirits. On the whole, this long article favors Strelan (summarizing his arguments concisely). The inscription says that the temple of Artemis was a place of much gladness and that the goddess rescued the city from an evil magician who brought down a plague on the city. There are two sections on Public life in the Greco-Roman world. Entry 11 describes a marble inscription in Latin and Greek honoring Augustus for sponsoring the paving of a street in Ephesus 22/21 B.C. While the inscription itself was discovered in 1958, an article appeared in 1991 which used this inscription to illustrate benefaction in the Roman world. Twice in this brief inscription the gift which Augustus made to the city of Ephesus is described as χάρις, a “gift.” The source of the gift is the Empire and the “sacred revenue” of the Temple. As Harrison points out, Augustus became “an iconic example of beneficence” and a model for other benefactors to follow. Later, Tiberius would be called “the benefactor of the world.” Since the Emperor and Empire was a source for huge sums of money, provincial elites in Ephesus found ways to exploit their patronage and line their own pockets. Harrison cites an edict dated A.D. 44 which indicates that selling the office of priest of Artemis was a lucrative trade. Harrison suggests that this benefaction (and corruption of the system) illustrates Paul’s use of grace-language in Ephesians as well as his frequent used of wealth metaphors in the book. “Paul’s language of ‘wealth’ in Ephesians could also be profitably looked at against the background of the wealth of the Artemis cult” (61). Four articles comprise the section entitled “Household.” D. C. Barker describes an Egyptian divorce agreement dated A. D. 177, on papyri. Among the fascinating details is the fact that the wife Aphrodisia is 21 years younger than her husband, Ptolemaios. From census records Barker points out that 83% of men were older than their wives, from one to thirty years older. One of the more fascinating articles in this section is entitled “Every Dog Has Its Day.” The text is from a limestone sarcophagus from Termessos (Psidia). This is a eulogy for pet dog, Stephanos, written by the owner Aurelia Rodope. She “wept for the dog and buried him as a man.” Harrison discusses the popularity of pet dogs in the Roman world, stating that some “Mediterranean peoples were besotted by the small white long-coated Melitaen” (127). There are many examples from Gerco-Roman literature as well as inscriptional evidence that dogs were often fed from the table. This devotion to dogs as pets seems to stand in contrast to Jesus’ attitude toward the Syro-Phoenician in Mark 7:26. It is customary to emphasize more negative the Jewish attitude toward Gentiles; they are “dogs.” But Harrison points out that the image of a dog could be taken as positive, indicating that after the children are fed (the Jews) it is appropriate for the dogs (the Gentiles) to receive food. Five articles are collected under the heading “Judaica,” including a pay slip for a Roman soldier at Masada and comments on two well-known items, the Temple Warning and the Babatha Archive. The Babatha archive is a collection of documents found at Nahal Hever (near En-Gedi). The documents are her important legal papers” and date to about A.D. 125. The documents were stored before the Bar Kokhba revolt, perhaps hinting that she participated in the revolt. The burden of this article is to compare the documents to Roman Law, especially with respect to marriage, divorce, polygamy, and guardianship. Babatha was a “second wife” to her husband Judah, leading G. Rowling to suggest that polygamy was not only practiced by the upper echelons of society, but may have been practiced in traditional rural areas as well (151). Conclusion. Virtually every section of New Documents Volume 10 is worthy of attention. The entries make for fascinating reading and they all contribute to our understanding of the world of the New Testament and early Christianity. I highly recommend this volume to students and scholars. Every serious library should own all ten volumes of this important series. I look forward to additional volumes in the series, although my preference is that the next volume arrives sooner than ten years from now. After a more than ten year wait, a new volume of the New Documents series has finally been released. 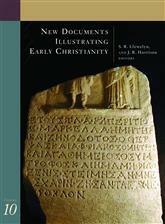 New Documents Volume 9 came out in 2002, covering Greek inscriptions of interest to Early Christianity published in 1986-87; this new volume covers 1988 through 1992. To give you some perspective on how important this series is, I did a search in A Greek-English Lexicon of the New Testament (BDAG), the current edition of the standard lexicon for New Testament Studies in English. There were 354 hits in 323 articles in the lexicon. BDAG only included material through volume 8 of the New Documents series. The New Documents series provides a database on which future lexical studies will rely. Because this is such an important book, my review is quite long. I have therefore decided to break it into two parts, the second appears here. That first volume covered documents published in 1976. After more than thirty years, the series now has ten volumes which cover published material through 1992. The tenth volume covers more years than the last and contains about 50 pages more in the main section than volume nine. In addition, Volume ten contains six cumulative indices for volumes 6-10, including subjects, words (sub-divided into Greek, Latin, Hebrew and Aramaic), ancient authors, inscriptions, papyri, and biblical works (sub-divided into Hebrew Bible, Apocrypha, Pseudepigrapha, Qumran, Rabbinic literature, and the New Testament). My suggestion to E. A. Judge and the New Documents project is to merge the index for the first five volumes with this index and move the whole thing online. That would allow scholars to search the whole series from a single index, and the index could be edited and expanded. In addition, moving the indices online would save nearly 100 pages in this volume which could be used for additional articles! Each volume is sub-divided into sections, although the sections are unique to each installment. For example, volume nine had two long sections for inscriptions and papyri; volume ten divides the material topically. Each entry begins with an entry number and a title for the article. The entry begins with a physical description of the item including location, media (papyri, inscription, etc.) and suggested date. A transcription of the text is printed with the translation in a parallel column. The author of the article then provides a running commentary on the item, intentionally drawing out implications for the study of the New Testament or Early Christianity (the stated goals of the series). In the first section of Volume 10, E. A. Judge contributes two articles on Philosophy. The second describes an inscription on a marble block from Philadelphia (Lydia) from the early first century. The inscription celebrates a person who has become wise, but more interesting is the arrangement of the site where the inscription was found. There is a narrow, straight path between illustrations to the left of ἀσωτία, distractions to wisdom (Luke 15:13,the prodigal son, Eph 5:18, Titus 1:6, 1 Peter 4:4), and illustrations to the right of ἀρετή, excellence of character (Phil 4:8). This illustrates the “two ways” found in a number of philosophical and biblical texts. Judge suggests that the arrangement of the site illustrates Jesus’ metaphor of ethical life as the “narrow way” (Matt 7:13-14). There are three articles on magic, including an interesting note on “overcoming the strong man” by J. R. Harrison. This article describes an inscription on a cameo dated A. D. 25-50 calling on Iao and Adonai (Greek transliteration of names for the God of the Hebrew Bible) to protect the wearer, one Vibia Paulina. All of the names on this early first century amulet are found in later magical texts, indicating that these sorts of “power words” were used to ward off evil. This illustrates the use of “Jesus whom Paul preaches” in Acts 19, but also the words of the demon in Mark 1:24. In that text the demon indicates that he has knowledge of Jesus’ real name, the “Holy One of God.” The amulet uses the phrase “holy name” as one of the powerful names invoked to protect the wearer. Harrison points out a close parallel: “I know you Hermes, who you are and where you come from and what your city is, Hermopolis” (PGM VIII 13). Conclusion (Part 1). Even though I plan to continue this overview of the book tomorrow, let me conclude this first section by saying that virtually every section of New Documents Volume 10 is worthy of attention. The entries make for fascinating reading and they all contribute to our understanding of the world of the New Testament and early Christianity. I highly recommend this volume to students and scholars. Every serious library should own all ten volumes of this important series. The May 2013 Biblical Studies Carnival will be hosted by Jeff Carter over at That Jeff Carter Was Here. This is a “call for links” to blogs of interest published in May 2013. Email the links to Jeff (thatjeffcarterwashere at hotmail.com) or leave a comment with a link. I find May to be a slow month for my blog (I blame the end of semester blues). But there were many excellent blog posts this month in the world of biblical studies – what are the blogs you read this month which contributed to the discussion of biblical literature theology, and culture? What posts made you think more deeply? 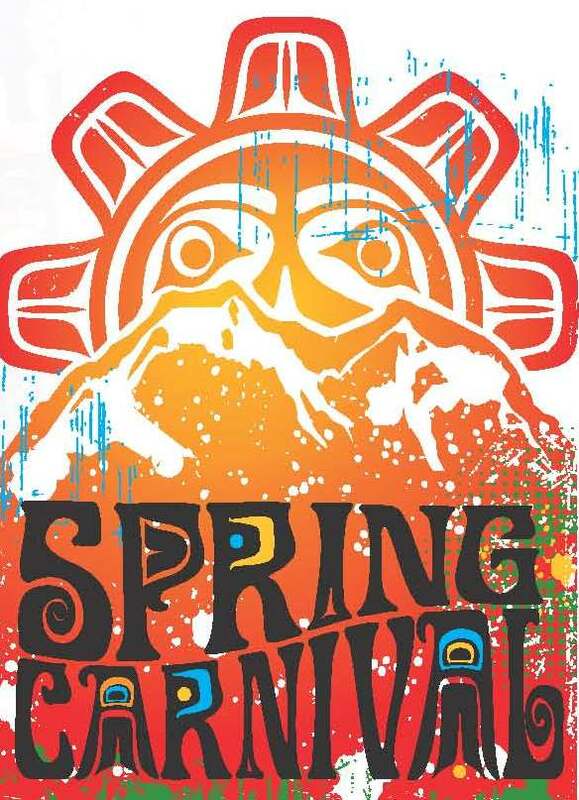 Send the links to Jeff and look for his Carnival around the first of June. I am also looking for more volunteers for the 2013 Carnival Season, August through the end of the year are open. Andrew King at The Blog of the Twelve is up for the June Carnival (due July 1), but the rest of the year is more or less open. Please email me (plong42 at gmail.com) and pick your month! Carnivals are a great way to attract attention to your site if you are new blogger, but more importantly it gives you a chance to highlight the best and the brightest in the world of bibliblogs. 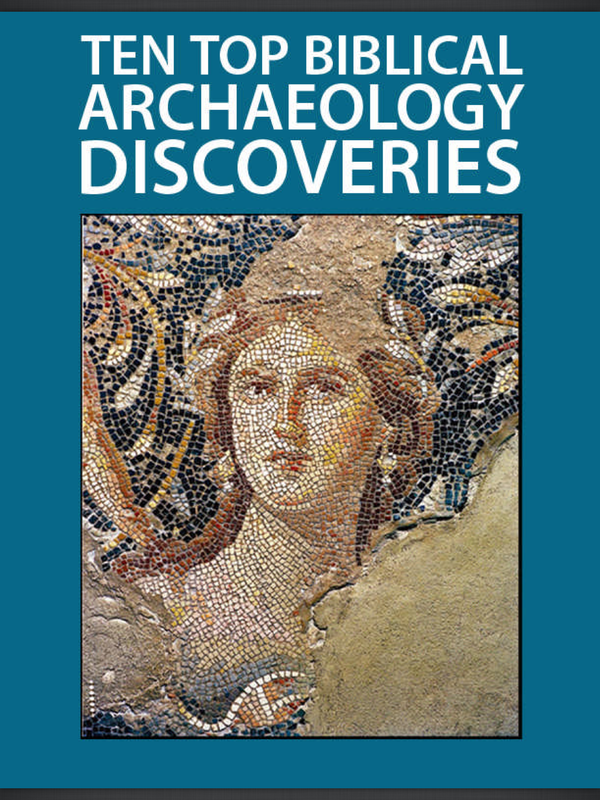 Biblical Archaeology Review is giving away a copy of their ‘Top Ten Archaeological Discoveries in exchange for your email address. Follow the link and sign up for the BAR daily emails and you will get a link to the book in PDF format, easily read on any platform. I saved the file right to my Dropbox and opened it on my iPad and opened it with the Kindle Reader, although it will open with many other PDF readers. As for the list of Top Ten archaeological discoveries, it is mixed list. The Nag Hammadi library is first on the list, a worthy inclusion. But the book omits the Dead Sea Scrolls. At first I thought this was because the discoveries were all after 1974 (when the Biblical Archaeological Society was founded), but the Nag Hammadi library was discovered in 1945, the same time as the Dead Sea Scrolls. I think that the mosaic from Sepphoris on the cover of the book is beautiful, but I am not sure it rates the top ten. For the cost of your email address, this is good book to download. Everyone will disagree with about any “top ten” list, at least this one is free. Kierspel, Lars. Charts on the Life, Letters and Theology of Paul. Grand Rapids, Mich.: Kregel, 2012. 284 pages, pb. $26.99. Link to Kregel. Kregel has recently revived the idea of a “chart book with their “Charts of the Bible and Theology” Series. I reviewed Herb Bateman’s Charts for the Study of Hebrews earlier this year. Lar Kierspel (Ph.D., The Southern Baptist Theological Seminary) contributes a collection of charts for Pauline studies. As with most books of this type, some charts are more useful than others, but my overall impression is that this is a useful book for teaching the Pauline letters. The first 8 charts (13 pages) are concerned with background material, including the history and structure of the Roman empire. Chart 6 (Paul’s Greco-Roman Background) lists a number of words / concepts in the Pauline letters that resonate with Greco-Roman philosophy, ethics, and culture. The material presented here is good, but sometimes not tied as closely to the Pauline letters as they could be. For example, there is a nice chart summarizing Greco-Roman philosophy, but this might be improved by indicating the Pauline ideas that are like / unlike these broad categories. Perhaps a chart tied to a book could have presented this material differently, such as Magic in Ephesus. The second set of 24 charts (38 pages) cover Paul’s life. This section deal with chronology and attempts to blend Acts and the Pauline letters. Some of these are long lists (all the men in Paul’s letters, for example). A six-page chart collects all the verses in Paul’s letters describing his opponents (with descriptive phrases in bold text). Chart 32 collects opinions on why Luke finished Acts without reporting Paul’s death, chart 33 collects traditions concerning Paul’s trip into Spain, and chart 34 collects 6 texts reporting Paul’s martyrdom (1 Clement 55 through Lactantius). The largest section of the collection concerns the Letters of Paul. There are 42 charts covering all of the Pauline letters, including a “snapshot” for each book. In most cases this “snapshot” is a single page offering information on audience, occasion, opponents, structure, purpose, and any special features unique to the book. While these single pages connect the letters to the book of Acts, there is no specific date given for the book. Remarkably there is no chart offering various schemes for dates of the letters. Chart 77 collects a number of problem texts in the Pauline letters and offers extremely brief summaries of suggested solutions. I thought any one of these would make a decent chart. For example, the problem of “all Israel will be saved” in Romans 11:26 has five views suggested. By adding a list of scholars supporting each view, this would make a nice single-page chart. I personally found the charts on quotations and allusions in the Pauline letters very useful (charts 45-52). All of this data is drawn from Nestle-Aland 27 so there is nothing new here, but students who do not own the NA27 will find the chart helpful. I am not completely convinced that all of the allusions to intertestamental literal are valid. At best these are all potential allusions, but this is a problem with the NA27 list, not Kierspel. The fourth section covers Pauline theology. In general these follow the usual loci for theology, often simply listing words with texts. For example, chart 90 has three pages of “eschatological concepts,” a list of terms like destruction, resurrection or reward, with the Greek words and a few texts. There are several pages of virtues and vices which are laid out in the same fashion. There are a few special charts on the gifts of the Spirit (chart 93) and Elders (chart 94) that are more detailed. There is a single chart on the New Perspective on Paul, this ought to be read along with the page of explanation in the back of the book. There are a few charts that are interesting, but I doubt their usefulness. For example, chart 42 contains two useful charts listing the number of words in each Pauline letter alone with the number of hapax legomena (“spoken once,” words used only once in the New Testament). The first chart gives the percentage of total words in each book that are hapax, and the second the percentage of total vocabulary that are hapax. This is interesting and useful. But the next three pages list all 601 words which are hapax in the Pauline letters. While I did stare and these pages for a few minutes, I am not sure of the usefulness of this information. As with other books in this series, Kierspel has a paragraph on text explaining each chart in the final section. This 44-page section is important to read since it is here that he gives bibliography for the data he includes. In some cases these are mini-introductions to controversial topics (like Pauline chronology, for example). The book has an extensive 31 page bibliography. Conclusion. Like other books in this series, there a staggering amount of information presented in these charts. While I question the usefulness of some of the charts for classroom use, the book is a worth while investment for those who teach the Pauline letters in church or classroom. Thanks to Kregel Academic for kindly providing me with a review copy of this book. This did not influence my thoughts regarding the work. This was our last day in Israel, and we made it count. Staring at Tamar at 9AM, we drover north to En-Gedi. 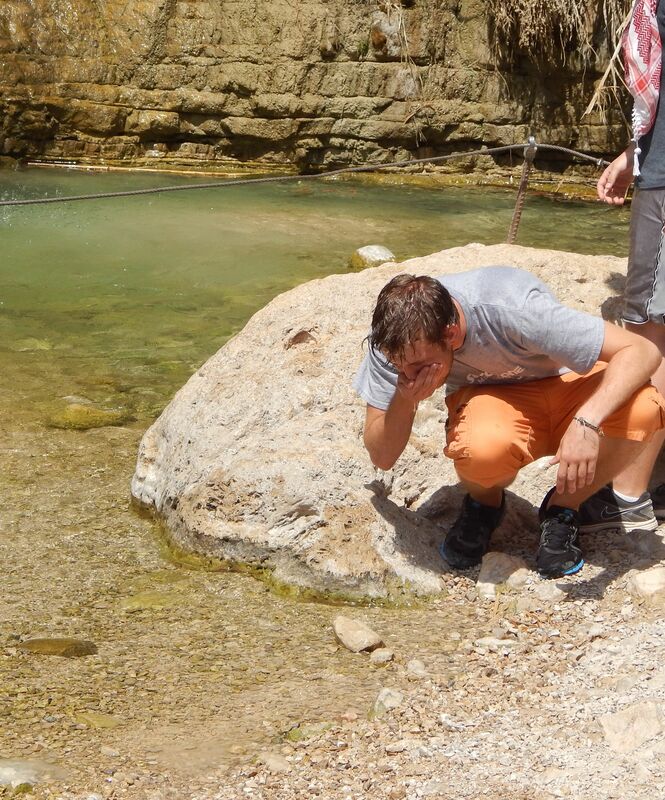 This is the canyon where David hid from King Saul in 1 Sam 24. While there are plenty of caves, I doubt any of the current caves are the place where David was hiding when Saul came to “cover his feet.” With a supply of water, shade, animals and defensive lookouts, it is little wonder that David would have used this canyon as a base of operations in the Negev. The Israeli Parks service has made this an easy hike, although there are a few scrambles up rocks. We started about 9AM, so the park was not really crowed, only a few small groups. We had a few photo ops with rock badgers, but the wild goats were all in hiding from the heat. We did see an unusually large fresh water crab. After drinking water (and eating ice-cream, just like David did I am sure), we continued north to Qumran. The site is little changed from previous visits, but this time there were almost no other visitors. It was about noon by this time and quite hot. Most groups do not even go out to the site, they stop for the buffet and shopping area. This is sad, because Qumran is one of the most significant sites for the study fo the New Testament. Since the Dead Sea Scrolls were found near the site, I usually take the time to talk a bit about the Essenes and the problems with the relationship between the villa at Qumran and the presence of the scrolls. I tend to accept the “standard” view that the villa was used by some Essenes and that they collected the scrolls and stored them away in the caves prior to A.D. 70. Because of the heat, we walked the site quickly and spent some time in the shaded area near the cave view talking about the contents of the Dead Sea Scrolls and why they are important to the study of the New Testament. After some lunch and shopping, we drive to the Inn of the Good Samaritan, a relatively new site on the road from Jericho to Jerusalem. This was a new site to me since it was only recently added to the National Parks pass. The main attraction is a nice museum of mosaics from various synagogues and churches. There is a room dedicated to the Samaritans as well. The museum is built on the site of a crusader era church dedicated to the Good Samaritan. If you have an hour or so, and do not have a group of tired college kids with you, it is worth a stop. After the Inn of the Good Samaritan, we drove to the Jaffa Gate for a final few hours of shopping in the Old City. Since it was a Friday afternoon, the crowds were a bit lighter than our previous visit. While most of the students had shopping lists of souvenirs they wanted to buy for people back home, I really just wandered around watching people. I listened to a Guide give an explanation of the Holy Sepulchre which was sad indeed. He gave far more time to the story of the Keeper of the Key than to Jesus. His talk was devoid of real history (mostly legends about the building) and he had no real idea who Jesus was. I guess it did not matter, most of his group were playing on their cell phones and not really paying attention. After we re-gathered we headed to the airport. As I said, this is Friday evening. Ben Gurion Airport was in Shabbat mode. Only a single coffee stand was open and the place was as silent as a grave. This was a pleasant change from the usually midnight flight crowds. Since our fight did not leave until 12:40 AM, we had to hunker down for a few hours. Passing through security was a big part of that time, since several of our people had to open bags and explain their 30 tiny jars of honey (or other odd images). Our return flights were smooth and on time. In fact, we got to Chicago before our drivers arrived to pick us up! This was a great trip overall. The students were excellent, attentive, and well behaved (at least in front of me). I thoroughly enjoyed the trip despite being sick for most of the time. Thanks to all of you who have been reading along. I obviously finished this last installment after I caught up on some sleep over the weekend!